Through the UK-India Education and Research Initiative (UKIERI) Partnership, Professors Ken Grattan and Tong Sun, and Visiting Professor Richard Scott, have partnered with the Indian Institute of Technology (IIT Roorkee) and engineering consultancy AECOM, to enhance the sustainability of cities in India. City’s engineering research collaboration with India was selected from among the top 20 projects showcased at a recent House of Lords event. Through the UK-India Education and Research Initiative (UKIERI) Partnership, Professors Ken Grattan and Tong Sun and Visiting Professor Richard Scott have partnered with the Indian Institute of Technology (IIT Roorkee) and engineering consultancy AECOM to enhance the sustainability of cities in India. The 10th anniversary of the UK-India Education Research Initiative (UKIERI), was marked with a celebration at the House of Lords on 23rd January. With UKIERI's sponsorship, City academics – Professors Ken Grattan and Tong Sun – have joined forces with Visiting Professor Richard Scott and the Indian Institute of Technology (Roorkee), together with engineering consultancy AECOM, to enhance the sustainability of cities in India. The City collaboration, which began in 2015, was selected as one of the top 20 projects funded by UKIERI. Its objective has been to enhance the sustainability of cities through the development of and use of a smart fibre-reinforced polymer (FRP) wrap for monitoring and repairing old structures, using a smart laminated carbon fibre-reinforced composite polymer (FRP) wrap, embedded with fibre-optic strain sensors for rehabilitating or retrofitting city infrastructure. "The UKIERI programme has been instrumental in bringing UK and Indian academics together to undertake proof-of-principle projects which enable the feasibility of new ideas to be tested. The extensive facilities that our Indian partners have brought to this project have enabled us to do a number of tests and evaluations of the new technology that we are developing. We have been permitted an opportunity to publish the outcomes together in the international media. It has been an excellent forum for cooperation." 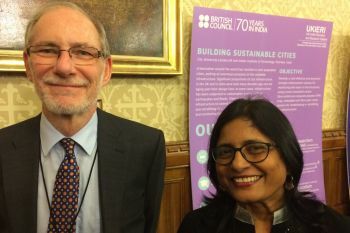 Baroness Prashar of Runnymeade, CBE, Director of British Council India, Alan Gemmell, OBE, and Manjula Rao (Director of Higher Education and Society, British Council India) were among several dignitaries attending the House of Lords celebration. 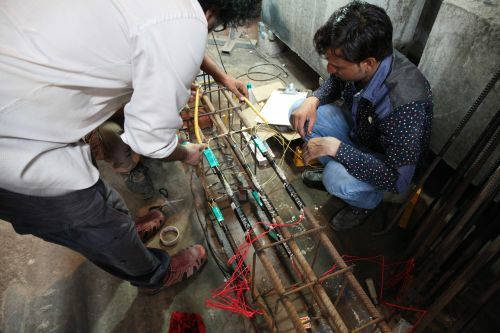 The project’s outcomes include the creation of a smart wire prototype, the active partnering of engineering expertise from the UK and India with industry-based optical-fibre solutions, the training of Indian researchers in manufacturing, and the application of smart wraps to enhance technology transfer. The UK India Education Research Initiative (UKIERI) started in April 2006 with the aim of enhancing educational links between India and the UK and City academics have been actively involved in many of these. It has been recognized as a key multi-stakeholder programme that has strengthened the educational relations between the two countries and been successful in covering all segments of the education sector.